Our research demonstrates results. A clinical study showed a balancing of the autonomic nervous system within just 10 minutes of patch application. This is a result of a calm, stress-free state. In another study, infrared imaging illustrated a decrease in inflammation in response to Aeon. Other clinical test demonstrated that Aeon lowers C-reactive proteins (which rise in response to inflammation). This is important because inflammation is often a symptom of stress and it can damage healthy tissue and even DNA. Although we may not think about it this way, the stress of daily life creates a tremendous impact on how we age. You can probably identify people in you own life who have been under so much stress that they seem to age before you eyes. And the evidence for the link between stress and aging isn't just anecdotal. For more than fifty years, physiologists have known that stressing an animal will cause it to age very quickly. Stress produces harmful free radicals and other bio-chemicals that can damage our tissue and DNA. Recent research also shows that chronic stress reduces levels of DHEA (dehydroepiandrosterone), a powerful hormone directly connected to lifespan, and increases levels of the stress hormone cortisol, which has been linked to accelerated aging. 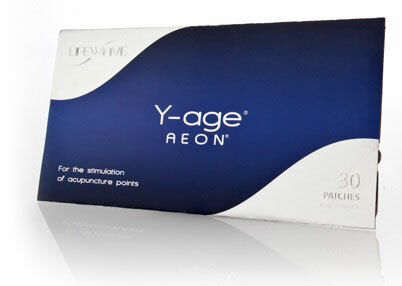 But we now have a powerful new weapon in the battle against stress and aging - the Y-Age Aeon patch. This revolutionary new product is designed to help promote an "anti-stress" response in your body. Lower levels of stress have been shown to help combat the ravages of aging. The Aeon patch is applied to acupuncture points that have been known to stimulate the immune system, so you can get the maximum benefits from this product. Your autonomic nervous system is perhaps the most important indicator of how your body handles stress. This regulatory system controls most of the involuntary activities of your body, such as digestion, metabolism and heart rate. 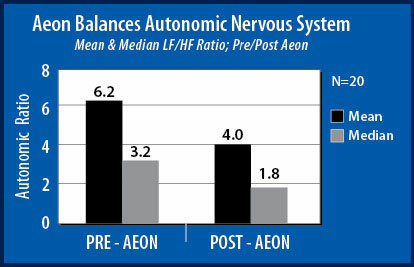 Our research has shown that Y-Age Aeon helps support the balance of the autonomic nervous system, ultimately decreasing the body's stress response. "We had hypothesized that the Aeon patch would bring the autonomic nervous system more in balance. It appears that this result did occur as shown above." 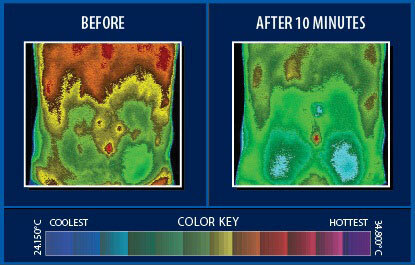 "Infrared imaging provides visual representation of the Aeon patch at work. After 10 minutes you can see a clear drop in local temperature, indicating a reduction in inflammation." Because research is a top priority at LifeWave, our products are subjected to rigorous testing. Y-Age Aeon is no exception. Studies have been conducted to show the efficacy of the Aeon patch, and to help uncover the significant benefits of this innovative product. "The Aeon study was such a revelation! Everyone felt stronger, all participants improved and some even asked for more patches. In the long run, it is my opinion that bioelectrical improvement in organ function will mitigate the deteriorating effects of aging on the organs." "The participants wearing the LifeWave Aeon patch showed a significant improvement on all three scanning devices used in this study. In addition, positive responses were expressed by every participant wearing the Aeon patch in the MYMOP 2 questionnaire." "Sympathetic drive was reduced, parasympathetic drive was increased and a balance was achieved. This has important implications for stress and aging, both of which often involve heightened sympathetic drive. In our opinion, the Aeon patch therefore provides valuable protection from stress and aging." "There was a clear decrease in pain levels in the majority of the participants. The majority of participants also experienced improved energy and mental focus. Overall, my study revealed that there were several people who had tried other Lifewave products and found a completely different physiological response with Aeon." I was thrilled with the ACULIFE patches and the ADVANCED PATCH PLACEMENTS TO INCREASE ENERGY!